It can be a bit tricky to find the perfect applique designs, especially if you have a particular vision in mind. I thought I'd share a few of my tricks and if you have any of your own, feel free to share. Unless I have a particular image I'm working off of (like a pattern from clothes that I'm trying to match), I usually start with a quick internet image search. One of the tricky parts of finding the right image is an image simple enough. If there are to many details, it can be hard to translate that onto fabric...especially when you keep in mind that you'll be sewing around the whole thing. 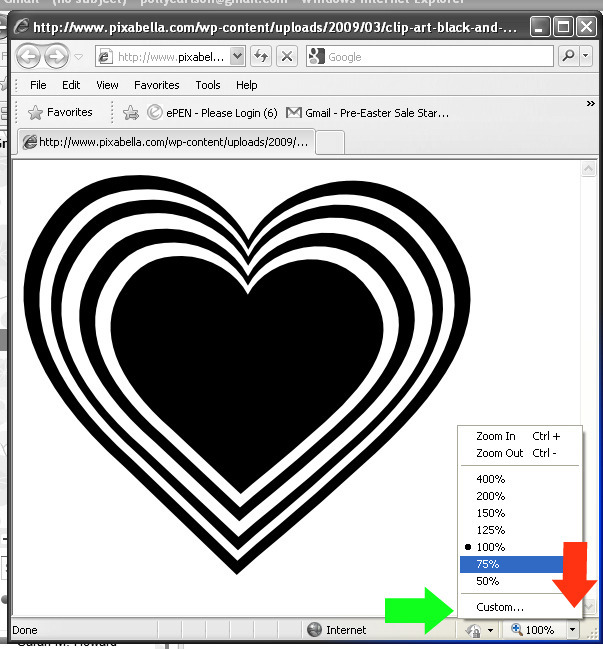 Including "clip-art, silhouette, and/or coloring page" in the search terms can be helpful because these types of images are more likely to be usable than photographs. For example, when I was making a sea turtle design (that will be coming soon for all of you), I used the search terms, "turtle silhouette" in a google image search and came up with some great starting points. Once you find the image the hard part is done. 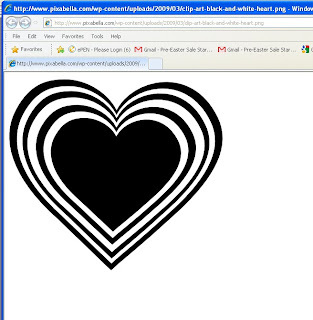 I used to resize the image using photoediting software or Word, print it out, and trace it. There are a couple problems with this though...it's a pain...half the time when I print it out, it still turns out not to be the right size...and it's a pain. 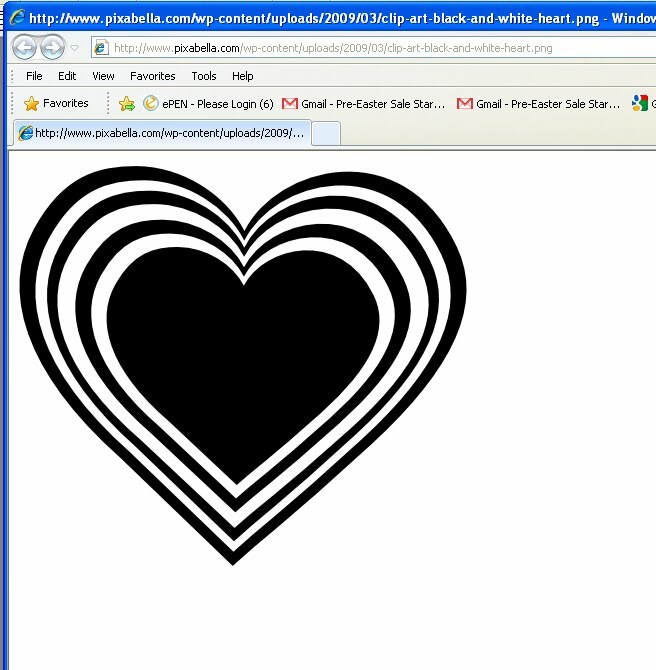 Finally I got smart and started resizing the images in my web browser and tracing it right of the screen. You have to be careful not to press too hard and damage your screen, but this saves so many steps and resizing is a breeze. For those of you who don't know how to do this...I'll show you. When I was making the quadruple heart applique, I found a layered heart I liked, but the layers were too close together for what I wanted. I needed to do some resizing, and I was able to do it right in my web browser. There are two ways. The easist is to use the "Status Bar" at the bottom of the Internet Explorer window. 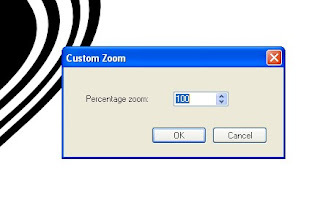 You go down to the bottom right corner and click on the triangle next to where is says 100%. (Red arrow)That will make this nifty menu open up. 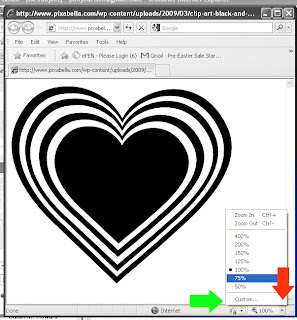 You can click on one of the options, or if you want a size in between...or a size bigger than it gives you, click on "Custom" (Green arrow). If for some reason you don't have the "Status bar" turned on, you can access this same menu by going to "View" menu, then clicking on "Zoom" and then choosing one of the options. I also used basically this same technique to make the double dino pattern. I saw a design I loved on Little Lizard King and resized it to fit my son's shirt. Tricky girl! I wouldn't have thought that the size of an image on my computer screen would end up affecting how well I could applique. Thanks for the tips. Oooh this is great! Thanks so much for sharing your process, I'll be linking. great tutorial but it's worth reminding people that "finding" art on the internet can also mean using someone's art without their permission. Just remember to be careful and make sure that what you use is truly clip art with no restrictions. Great applique tips. Thanks for sharing and for linking up with Sugar & Spice. Gosto do seu cantinho... sempre agradável, criativo e encantador... você é muito talentosa.